Folate deficiency increases stroke risk. We examined whether folate deficiency affects platelet endothelial cell adhesion molecule-1 (PECAM-1), which is an immunoglobulin-associated cell adhesion molecule and mediates the final common pathway of neutrophil transendothelial migration, in blood vessels in the gerbil dentate gyrus after transient forebrain ischemia. Gerbils were exposed to a folic acid-deficient diet (FAD) for 3 months and then subjected to common carotid artery occlusion for 5 min. In the control diet (CD)- and FAD-treated sham-operated groups, weak PECAM-1 immunoreactivity was detected in the blood vessels located in the dentate gyrus. PECAM-1 immunoreactivity in both groups was increased by 4 days after ischemic insult. PECAM-1 immunoreactivity in the FAD-treated group was twice as high that in the CD-treated-sham-operated group 4 days after ischemic insult. Western blot analyses showed that the change patterns in PECAM-1 protein levels in the dentate gyrus in both groups after ischemic insult were similar to changes in PECAM-1 immunohistochemistry in the ischemic dentate gyrus. Our results suggest that folate deficiency enhances PECAM-1 in the dentate gyrus induced by transient ischemia. The blood-brain barrier (BBB) is a physiological barrier between the blood and the central nervous system (CNS) and is composed of brain parenchymal microvascular endothelial cells, astrocyte foot processes and pericytes. The BBB exhibits a low and strictly controlled permeability to blood-borne compounds, mainly due to the presence of interendothelial tight junctions . When the brain has inflammatory situations, massive infiltration of leukocytes is observed in the brain tissue, together with the expression of various adhesion molecules such as selectins and immunoglobulin superfamily on the surface of cerebral vascular endothelium . Inflammation is a hallmark of various CNS diseases such as bacterial and viral infections, multiple sclerosis, trauma, Alzheimer’s disease, and cerebral ischemia [2, 25]. Transient forebrain ischemia produced by the temporary deprivation of blood flow to the brain causes the insidious delayed degeneration of specific vulnerable neurons in the hippocampus, neocortex and striatum . The neuronal death is caused by depolarization-induced calcium entry via N-methyl-d-aspartate receptors [3, 30], by intracellular free radical generation [1, 5, 35] or by cell death pathway . The expansion of infarction after ischemia is due to microcirculatory disturbance  and selective neuronal vulnerability . The microcirculatory disturbance may be induced by forming capillary block, BBB damage, vasoconstriction, biochemical mediators such as reactive oxygen species (ROS), leukotrienes, cytokines, platelet-activating factor, and proteolytic enzymes stemming from interaction between leukocytes and perturbed endothelium in the ischemic region [9, 33]. Platelet endothelial cell adhesion molecule-1 (PECAM-1, CD-31) is a member of the immunoglobulin-associated cell adhesion molecule family and present on neutrophils and endothelial cells, and which mediates the final common pathway of neutrophil transendothelial migration . Up to now, no studies reported the ischemia-related changes of PECAM-1 expression in the dentate gyrus after transient forebrain ischemia in the Mogolian gerbil. Therefore, in the present study, we examined the chronological alteration of PECAM-1 immunoreactivity in the dentate gyrus after 5 min of transient forebrain ischemia using a gerbil ischemia model. The progeny of male Mongolian gerbils (Meriones unguiculatus) were obtained from the Experimental Animal Center, Hallym University, Chuncheon, South Korea. Mongolian gerbils were used at 3 months of age (body weight, 35 ± 0.5 g). The animals were housed in a conventional state under adequate temperature (23°C) and humidity (60%) control with a 12:12 h light:dark cycle, and exposed to a control versus experimental diet for 3 months. The control diet (CD) was a standard mouse diet, which contained defined choline and folate (Altromin control diet C1000 or AIN93), whereas the experimental diet, folic deficient diet (FAD, <0.5 mg/kg; Altromin, special diet C1027). Both chows were supplemented with 1% succinylsulfathiazole (Sigma-Aldrich, Miss., USA) for selective intestinal decontamination. The animals were fed with the respective diet ad libitum for 3 months. All of the experiments were conducted to minimize the number of animals involved and the suffering caused by the procedures used in the present study. After 3 months on the diets, blood was taken for analysis of homocysteine levels. Homocysteine levels in serum samples were quantified with the use of an IMx immunoassay analyzer (Abbott Laboratories) according to the protocol provided by the manufacturer. The animals were anesthetized with a mixture of 2.5% isoflurane in 33% oxygen and 67% nitrous oxide. Bilateral common carotid arteries were isolated and occluded using non-traumatic aneurysm clips. The complete interruption of blood flow was confirmed by observing the central artery in retinae using an ophthalmoscope. After 5 min of occlusion, the aneurysm clips were removed from the common carotid arteries. The body (rectal) temperature under free-regulating or normothermic (37 ± 0.5°C) conditions was monitored with a rectal temperature probe (TR-100; YSI, USA) and maintained using a thermometric blanket before, during and after the surgery until the animals completely recovered from anesthesia. Thereafter, animals were kept on the thermal incubator (Mirae Medical Industry, South Korea) to maintain the body temperature of animals until the animals were euthanized. Sham-operated animals were subjected to the same surgical procedures except that the common carotid arteries were not occluded [14, 16]. Sham-operated and ischemia-operated animals (n = 7 at each time point) at designated times (1, 2 and 4 days after the surgery) were sacrificed. The animals were anesthetized with sodium pentobarbital and perfused transcardially with 0.1 M phosphate-buffered saline (PBS, pH 7.4) followed by 4% paraformaldehyde in 0.1 M phosphate-buffer (PB, pH 7.4). The brains were removed and post-fixed in the same fixative for 6 h. The brain tissues were cryoprotected by infiltration with 30% sucrose overnight. Thereafter, frozen tissues were serially sectioned on a cryostat (Leica, Germany) into 30-μm coronal sections, and they were then collected into six-well plates containing PBS. To obtain the exact data of immunohistochemistry, the free-floating sections were simultaneously processed by immunohistochemistry under the same condition. The animals were anesthetized with pentobarbital sodium, and perfused transcardially with 0.1 M phosphate-buffered saline (PBS, pH 7.4) followed by 4% paraformaldehyde in 0.1 M PB (pH 7.4) at the designated times after the surgery. Brains were removed, and postfixed in the same fixative for 6 h. The brain tissues were cryoprotected by infiltration with 30% sucrose overnight. Thereafter the tissues were frozen and sectioned with a cryostat at 30 μm and consecutive sections were collected in six-well plates containing PBS. The sections were sequentially treated with 0.3% hydrogen peroxide (H2O2) in PBS for 30 min and 10% normal horse serum in 0.05 M PBS for 30 min. The sections were next incubated with diluted mouse anti-PECAM-1 antibody (diluted 1:1,000; SantaCruz Biotechnology, Calif., USA) overnight at room temperature. Thereafter, the tissues were exposed to biotinylated horse anti-mouse IgG and streptavidin peroxidase complex. The sections were visualized with 3,3′-diaminobenzidine in 0.1 M Tris-buffer and mounted on the gelatin-coated slides. Five animals in each group were used for immunoblot study. 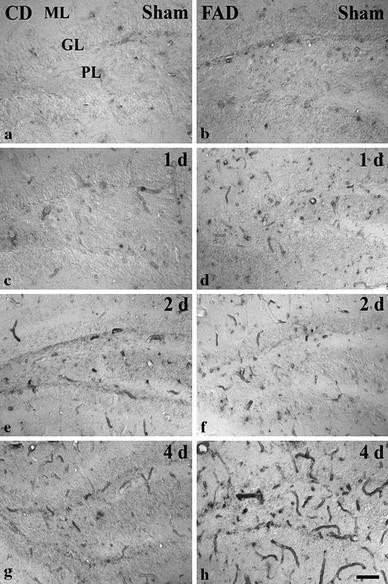 The dentate gyri were dissected from the hippocampus, and homogenized in 50 mM Tris containing 50 mM HEPES (pH 7.4), 0.1 mM EGTA (pH 8.0), 0.2% NP-40, 10 mM EDTA (pH 8.0), 15 mM sodium pyrophosphate, 100 mM β-glycerophosphate, 50 mM NaF, 150 mM NaCl, 2 mM sodium orthvanadate, 1 mM PMSF and 1 mM DTT. After centrifugation at 10,000 g for 1 h, the protein concentration was determined in the supernatants by using the Micro BCA protein assay kit with bovine serum albumin as the standard (Pierce Chemical, USA). Aliquots containing 20 μg total protein were boiled in loading buffer containing 150 mM Tris (pH 6.8), 3 mM DTT, 6% SDS, 0.3% bromophenol blue and 30% glycerol. Then, each aliquot was loaded onto a 10% polyacryamide gel. After electrophoresis, the gels were transferred to nitrocellulose transfer membranes. To reduced background staining, the filters were incubated with 5% non-fat dry milk in PBS containing 0.1% Tween 20 for 45 min, followed by incubation with mouse anti-PECAM-1 antiserum (1:2,000) and rabbit anti-β-actin diluted 1:1,000 (Santa Cruz Biotechnology), with peroxidase conjugated horse anti-mouse IgG (Sigma), and then with ECL kit. In order to quantitatively analyze PECAM-1 immunoreactivity, the corresponding areas of the dentate gyrus were measured from 10 sections per animal. Images of all PECAM-1 immunoreactive structures were taken from 3 layers (molecular, granule cell and polymorphic layers) through an AxioM1 light microscope (Carl Zeiss, Germany) equipped with a digital camera (Axiocam; Carl Zeiss) connected to a PC monitor. Video images were digitized into an array of 512 × 512 pixels corresponding to a tissue area of 140 × 140 μm (40x primary magnification). Each pixel resolution was 256 gray levels. The staining intensity of all PECAM-1 immunoreactive structures was evaluated on the basis of a relative optical density (ROD), which was obtained after the transformation of the mean gray level using the formula: ROD = log (256/mean gray level). The optical density of background was taken from areas adjacent to the measured area. After the background density was substrated, a ratio of the optical density of image file was calibrated using Adobe Photoshop version 8.0 and then analyzed using NIH Image 1.59 software. The relative percentage of control level was shown in the graph. The result of the Western blot analysis was also scanned, and the ROD was determined using Scion Image software (Scion Corp, USA). The data shown here represent the means of experiments performed for each experimental area. Differences among the means were statistically analyzed by one-way analysis of variance followed by student Duncan’s new multiple range method or Newman–Keuls test in order to elucidate differences among experimental groups. Folic acid deficiency rendered the FAD-treated group susceptible to ischemia/reperfusion. After 3 months on the diets, serum levels of homocysteine were determined and found to be 5- to 8-fold higher in gerbils subjected to FAD compared to CD group (Fig. 1). In the present study, PECAM-1 immunoreactivity in microvessels in the gerbil dentate gyrus was changed with time after ischemia/reperfusion (Figs. 2, 3). In the CD- and FAD-treated sham-operated groups, weak PECAM-1 immunoreactivity was detected in the blood vessels located in the dentate gyrus (Fig. 2a, b). One day after ischemic insult, PECAM-1 immunoreactivity in the CD-treated group was similar to that in the CD-treated sham-operated group. However, PECAM-1 immunoreactivity in the FAD-treated group was higher by 50% than that in the CD-treated sham-operated group (Figs. 2c, d, 3). Thereafter, PECAM-1 immunoreactivity in both groups was significantly increased by 4 days after ischemic insult (Figs. 2e–h, 3). At this time after ischemia/reperfusion, PECAM-1 immunoreactivity in the dentate gyrus of the FAD-treated group was much higher than that of the CD-treated group. In this study, the results of Western blot analyses showed that the patterns of changes in PECAM-1 protein levels in the ischemic dentate gyrus in both groups were similar to changes in PECAM-1 immunohistochemistry in the ischemic dentate gyrus (Fig. 4). One day after ischemia/reperfusion, PECAM-1 protein level in the FAD-treated group began to increase (Fig. 4). Four days after ischemic insult, PECAM-1 protein level in the FAD-treated group was 2.5 times higher than that in the CD-treated group (Fig. 4). Kirino  reported that three different types of ischemic damage were observed in the hilar region of the dentate gyrus, the hippocampal CA1 and CA2 region, after 5 min of transient forebrain ischemia in gerbils. In the hilar region of the dentate gyrus, neuronal changes were rapid and corresponded to ischemic cell change. Alterations in the CA2 region were relatively slow and identical to what has been called reactive change; in contrast, changes in the CA1 pyramidal cells were even slower . In the present study, serum levels of homocysteine were found to be 5- to 8-fold higher in gerbils subjected to FAD compared to CD group. Folate is a cofactor in 1-carbon metabolism, during which it promotes the remethylation of homocysteine. Control of folate has a major impact on homosysteine levels, with an inverse relationship between plasma folate and homocysteins levels [11, 26]. Many epidemiological studies have related folate deficiency and resultant elevated plasma total homocysteine levels with an increased risk of vascular disease and ischemic stroke [8, 11, 12, 19, 26]. Folic acid deficiency and high homocysteine levels can be directly toxic to cultured neurons by mechanisms that involve uracil misincorporation, impaired DNA repair, and DNA damage [20, 21, 23]. Endres et al. reported that folate deficiency in the mouse increased homocysteine level in the serum and cerebral lesion volume. In the present study, we observed that PECAM-1 immunoreactivity and protein level in the dentate gyrus of the CD- and FAD-treated gerbils were increased with time after ischemic insult. In addition, we found that the immunoreactivity and level of PECAM-1 in the FAD-treated group were much higher than those in the CD-treated group after ischemia/reperfusion. Four days after ischemia/reperfusion, PECAM-1 immunoreactivity and protein level in the FAD-treated group was 2 and 2.5 times higher than those in the CD-treated group, respectively. This result suggests that the increase of PECAM-1 immunoreactivity in the microvessels may be associated with the regional susceptibility against ischemic damage after transient forebrain ischemia, and that the elevation of PECAM-1 in the dentate gyrus may be due to neutrophil transmigration . Our data is supported by a report that, in stroke patients, PECAM-1 level was high in serum and cerebrospinal fluid compared to controls . It has been reported that the expression of PECAM-1 or other cell adhesion molecules were increased in the spinal cord ischemia , focal cerebral ischemia [9, 29], and other peripheral ischemia models [31, 33, 34]. The elevation of PECAM-1 immunoreactivity and its protein level in vessels increases the transmigration of lymphocytes and neutrophils [6, 27]. In addition, it was reported that PECAM-1 neutralizing antibody in rats subjected to ischemia/reperfusion reduced the myocardial infarct . PECAM-1 is expressed on endothelial cells and neutrophils, and has been targeted as a therapeutic route to diminish myocardial infarct size following reperfusion. It has also been reported that neutrophil transmigration and macromolecular leakage are increased in the ischemia/reperfusion group, whereas that the increase is attenuated in the animals treated with anti-PECAM-1 antibodies [32–34]. In brief, the elevation of PECAM-1 immunoreactivity and protein level in the gerbil ischemic dentate gyrus of the FAD-treated gerbils may be associated with an acceleration of ischemic damage. The authors would like to thank Mr. Seok Han, Mr. Seung Uk Lee, and Ms. Hyun Sook Kim for their technical help in this study. This work was supported by the BioFoods Project in Korea biotechnology Research Plan under Ministry of Science and Technology of Korea Government (M10510120004-05N1012-00411).